I’ve been friends with Steve for close to two decades, and he’s been building games and companies that make games for as long as I’ve known him. He bootstrapped a casual games company to 50 employees, and has developed some of the best selling casual games franchises in the world. So I ended up investing an exceedingly small amount of money as part of a friends and family round. By this time last year, most investors I know have become pretty jaded about VR as an industry. I was a VR super fan: I’ve owned the DK1, DK2, CV1 and Vive. They’re all pretty fun for a few days, and then they just end up sitting there collecting dust. That a VR experience that is SO close to the holodeck from Star Trek was technologically even possible, much less operating as a popup in the middle of nowhere on the 15th floor of a back alleyway in Hong Kong. Dissatisfied with the experience possible in consumer VR, a team integrated a movie quality motion capture rig, built real time inverse kinematics, made it work with multiple users in constrained spaces, developed a 30 minute long AAA game experience, constructed a retail store from scratch, figured out how to market it virally - all done by a clearly schlep-blind team of 7 with less than a million dollars raised (most of it from the founder Steve) in less than 4 months. There’s scrappiness, and then there’s whatever the hell you call this. I remain in awe of what Steve and his team at Sandbox VR had built. And that’s when I knew I had to be part of making this happen. December last year, I reluctantly left my extremely satisfying and fun job as VP of Growth at Postmates (they are hiring! ), relocated to Hong Kong, and I’m proud and fortunate to have joined Steve and his team at Sandbox VR as their Chief Product Officer. In the 12 months since we launched our first location in Hong Kong, we’ve been launching a new location every other month. We are now live in four countries and 6 locations around the world, with our installations in New York, Los Angeles, and Bangkok live in partnership with IMAX. By the end of the year, we will have 16 stores in 6 countries. We are now the #1 Activity and #10 overall thing to see or do in Hong Kong on TripAdvisor (#8 is Disneyland). We just launched our first franchise in Singapore about two months ago, and we’re already the #1 Activity in Singapore as well. 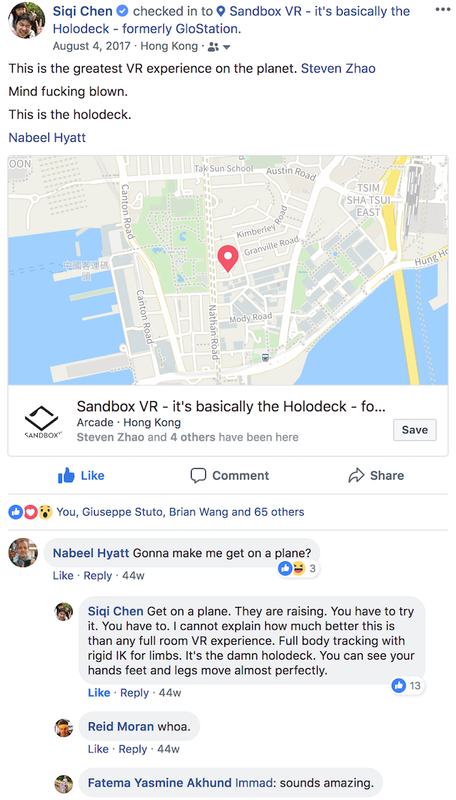 At Sandbox VR, we are bringing the holodeck to every neighborhood. We believe that the holodeck will happen, and that we will all want to use one. I believe that some of us will have holodecks at home, and for the rest of us, there will be dozens of holodecks in every neighborhood around the world. We believe that VR is the ultimate and final medium of expression — from pictographs to the written word to recorded audio to video, every evolutionary progression in fidelity of medium has brought us closer to a new place, a new experience, and to become new characters. Every step of the way, these mediums have allowed us to become more empathetic to a new person, or new experiences. We believe that VR will be bigger than Hollywood sooner than you think. We intend to help build thousands of these rooms around the world, and to create an ecosystem where developers can create amazing, long form, full body free roaming VR content to transform and transport guests no matter who they are, or where they are. 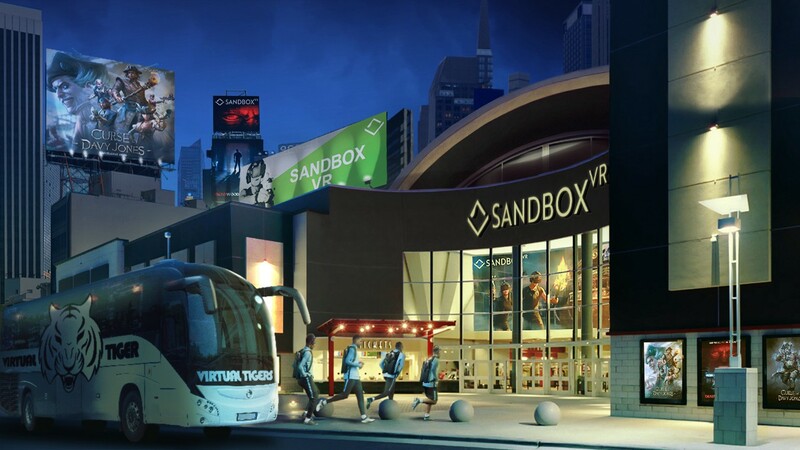 We look forward to having you experience Sandbox VR for yourself. If you live in the Bay Area, we are launching our first US corporate store next week, and you can book tickets now. We’re always looking for people who want to join us to bring the holodeck to every neighborhood in the world, so we’re hiring for all roles: growth, marketing, product, engineering, and design. The corporate blog of Sandbox VR.